“There was nothing to fear in Q4 but fear itself.” The stock market’s terrifying tumble at the end of last year proved short-lived, noted Howard Silverblatt, a senior index analyst at S&P Dow Jones Indices. In fact, the S&P 500’s bounce in the first quarter of this year regained almost all of the ground lost in the previous three months. 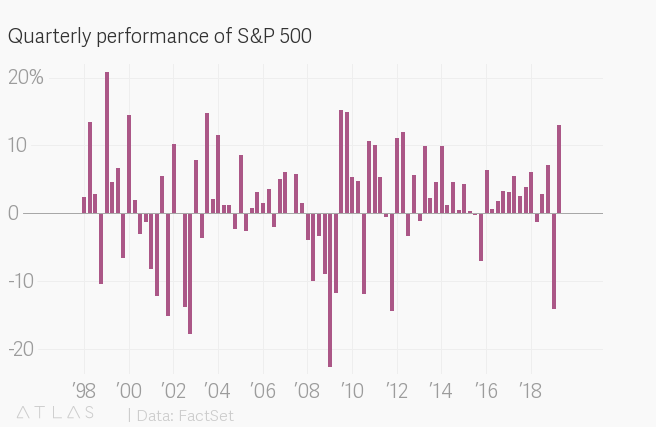 It was the best quarterly performance since the second quarter of 2009, and the biggest gain in a first quarter since 1998. After flirting with a bear market at the end of 2018, the S&P 500 is now just 3% short of its all-time high. Investors fell over themselves to invest in Lyft’s IPO on the last day of the quarter, suggesting that there is plenty of pent-up bullishness out there. The bond market, though, tells a different story. When bond investors pile into US Treasuries, German government bonds, and other haven assets, as they are doing now (paywall), it usually signals trouble ahead. Expectations for interest-rate hikes in the future have been waning, a sign that economic growth might not be as strong as expected. In April, companies will begin reporting their first-quarter earnings, providing a gauge of whether the bulls’ confidence or bears’ worries are more warranted.